Today is the feast of St. Mary Magdalene which is superseded by the Sunday Liturgy. The first reading is taken from the Book of the Prophet Jeremiah 23:1-6. In these seven verses, Jeremiah utters dire threats against the shepherds, the leaders of the people of Judah. Their neglect of the flock given into their care and their neglect of God was bringing exile on their people. God would avenge his people bring back the "remnant" of his flock and set trustworthy shepherds over them. The second reading is from the Letter of St. Paul to the Ephesians 2:13-18. St. Paul reminds his Ephesian converts that Christ has brought unity of brotherhood to Jews and Gentiles. The Gospel is from St. Mark 6:30-34. In these few verses St. Mark very strongly brings out the compassion, the human understanding of Jesus for man. He first planned to give his Apostles a well-earned rest. They had evidently worked hard while out on their mission and a few days rest would restore their lost energy. He himself, too, must have been hard pressed, preaching and dealing with the crowds. In the absence of the Apostles he had no one to help him—he too needed a rest. He, therefore, planned that he and they should go to a quiet corner of the Sea of Galilee where there was no village and where, therefore, they would not be disturbed. The desire of the crowds, however, to see him and to hear him speak upset these plans. The people got to the quiet spot first. There they were waiting when the boat pulled to shore. He could have sent them away, but again his human compassion took over. Seeing these simple people of Galilee so anxious to hear about God and his mercy, he let them stay and began to preach the good news of forgiveness and hope to them. For the most part they were simple, unlettered villagers, shepherds and fishermen. They knew a little about the Law of Moses but only a little. There was no one but the local rabbi to teach them and the local rabbis were not very educated at the time. The doctors of the law, the great theologians were all in Jerusalem where they got the respect and the financial reward which they felt they merited. Hence the people of the country were more or less forgotten and neglected. They were, as our Lord described them, "like sheep without a shepherd," wandering about half-lost. They were certainly fortunate, however, in finding the true shepherd who would lead them to the eternal pastures. Not only would he now sacrifice his rest to come to their aid but he would, later on, lay down his life for them and for all of us. We, like those poor people of Galilee, have so much to be grateful for. The compassionate Christ has had pity on us too, and has brought us into his fold. He knows all our infirmities and all our human weaknesses, and he is ever-ready to have pity on us and pardon us. Those people of Galilee were not saints, they were ordinary, run-of-the mill, not over religious people. They cheated one another; they were often uncharitable to one another; they were not always chaste and pure; they prayed very little and perhaps only when they wanted some material benefit. Yet our Lord had compassion on them. This should give us great confidence, great encouragement. Christ has not changed: he is the same yesterday, today and forever. He has the same compassion for us that he had for those Galileans; we too are often like sheep without a shepherd wandering half-lost through life. He is ever calling us to come to himself so that he will lead us to safe pastures. If only we would listen to his merciful call! Today's Gospel is one such call — it goes out to every member of this congregation who has been lax in his or her religious life up to now. Christ wants us back on the high-road to heaven. All we have to do is to break with the past, with the earthly things that kept us from God. We can set out as freemen to follow Christ. He has left to his Church the holy sacrament of penance in which he guarantees us complete and entire remission of all past sins if we confess them with true sorrow. Let us not think that our sins are too big to be forgiven, that Christ could not have compassion on us because of our dreadful past. We can remember those Galileans; many of them were sinners as we are and he had compassion on them. He came to call sinners, he tells us. Let us answer his call today—tomorrow might be too late. 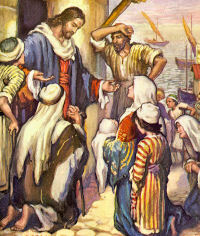 "He began to cast out those who were selling and buying in (the temple). 'My house is a house of prayer,' but you have made it a den of thieves" (Gospel). The tears of Jesus! The lashes of His righteous anger! Why does Jesus still weep? Why must He still "cast out?" Because amongst us there are those who desecrate what is consecrate–their baptized, Christened souls! even as Jerusalem, chosen by God, rejects His Christ (Gospel). Consider what happened to "idolaters," rejecting God; to materialists who lived merely "to eat and drink, and . . .play." War, disease, famine, depression were the penalty. "There fell in one day twenty-three thousand". Yet do not go through life with a fear complex. "God. . .will not permit you to be tempted beyond your strength" (Epistle).